Every year, I try to knit DH one sweater. He's a rather large guy, so it takes a long time to knit around him. Last year, I made him a Bohus sweater with a black background and I thought I had fallen into some sort of knitting black hole. Bohus sweaters, which I will post about at a later time, have highly intricate yokes composed of 10 or 15 colors, but the rest of the sweater is plain. In the case of last year's sweater, plain black. Totally plain black. Black, black black. The year before was a dark green Bohus. Green green green. This year, I simply couldn't face months of plain color. I had bought some clever JHB cat buttons and wanted to use them as decoration. I poked at some yarn at a few LYS, but they were undistinguished and worse, plain blue, plain red, plain beige. Meh. After grazing around the Internet, I decided that Lisa Souza's Alpaca Silk in the Wild Thing colorway was an perfect match to the buttons. The yarn is lovely to handle, too, with a fine drape and a bit of a silky halo. I swatched the yarn. Although the recommended needle size was 4 or 5, I am a loose knitter, and size 3 worked better for this yarn, which is a bit slippery. The bottom half of the lower swatch was done with the size 5 needle, the top half with a size 4. The upper swatch was knit with size 3. the yarn blocks nicely and is very soft. I highly recommend this yarn as an alternative, to say, qiviut. Of course, a sweater out of qiviut would cost about $2000, with your color choice of boring brown, boring brown, and boring brown. Aside: I made an earwarmer out of qiviut a few months ago. I will post on it at another time. Suffice it to say that this stuff is the most overpriced, overhyped fiber of the century. 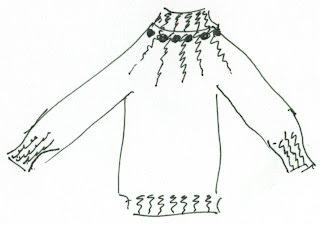 I have already designed the sweater using Knitware, my favorite designing software. You can read about it here: http://www.greatknitdesigns.com/desc.htm. I';m going to do the sleeves first, so I hope by next week I'll have something to show you. Thank you for sharing your knitting history. That's amazing knitting and truly amazing for 10 years old. My hands would have been so tired. I bet yours got tired, too. 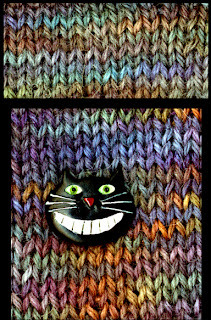 Love the button and it is interesting to see how the yarn is knitting up. Your kid knitting is wondrous. When I was that age, I was more interested in embroidering everything that was not nailed down. The filet crochet came in my 20's. It is fun to see what is happening with the interesting collection of yarns that have gone to a knitter on Roller Coaster Road...keep up the great work. But, man oh man, would it ever be warm... too warm! I just discovered your blog and love it. I'm particularly interested in the Japanese knitting as I have several pattern books and want to make so many of the sweaters. I'm just trying to figure out how to do it!